Being offline for long makes me partly happy coz I can catch up with things, one of 'em....reading ! Read any good books lately ?...I have....^^ I bought a few books but only impressed with one of them ..ever heard of He-La Cells ? 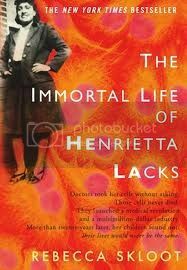 ...I studied about them in college....me recommending : The Immortal Life of Henrietta Lacks, by Rebecca Skloot. This book is not for the faint of heart and not for squeamish people^^ and it ain't light reading, as there's a lot of science , law and medical terminologies and other difficult vocabs. Don't read it if you have nightmares from reading something that scares you....Why do I like it ? The true story is incredible and incredibly moving !! Another thing I'm able to do is hunt for [free] i-pad apps..Yeaay ! the ones I saw were books you've probably read already. OK, me going...will be back. TTFN. That sounds like an interesting book Myoce. I have read a few Coehlo's recently and finally got to read the Host..I never thought I'd get around to it but it seems a very good read.I've still got a quarter left. Yes Hyds, it's very interesting... more incredible than fiction. ... have to go back and read Peanuts hahaha..
City of Ashes, City of Glass, and City of Fallen Angels [there's also the new Infernal Devices series from her]. For a bit heavier ones, The Abhorsen series or Old Kingdom series [Sabriel, Lirael and Abhorsen...I LOVE these books] by Garth Nix. Myoce, for the free apps, have you got Pulse n Zite? OK me NOW just realize who U R !! The magic words were "Jefry compwizkid." Thanks 4 d'info, will look into it. I'm playing Angry Birds, although not educational... it's great for killing time. Ha! How many momo do you know? So, Jefry has more bells in his name? Hahaha... I don't get to see you in the office, where have you been? I enjoy the kiss-kiss video, thanks for posting it. Hope you enjoy yr week too. Been spending these 3 days in Bandung heading back home later today. Did you get ole-ole Bandung ? Hehe just kidding !